He played and missed, groping at the ball again and again. Sometimes he hit it straight to fielders. Other times he just defended. Shane Watson had no runs from ten balls, an inauspicious start, given the demands of chasing nine runs an over. Indeed, only 20 balls into his team's innings, the required rate vaulted above ten. Yet this was the prelude to one of the greatest innings in IPL history - 117 not out from 57 balls, or rather, from 47 balls after those first ten scoreless deliveries - to win the 2018 title. Beginning an innings like Watson did raises the stakes. For every dot ball a batsman plays out early in the innings, the pressure on the team increases. Facing his tenth ball that day, Watson attempted a slog sweep and missed, narrowly avoiding an lbw. Had he been given out, he might well have been castigated for playing a match-losing innings. Instead, playing himself in and seeing off Bhuvneshwar Kumar's venomous new-ball spell gave Watson a base from which to explode. Some teams base their T20 strategy on batting cautiously in the Powerplay, aiming to minimise wickets lost, and accelerating later. Over the last three years Gloucestershire have scored at just over seven an over in the Powerplay - one of the slowest rates in the T20 Blast - but then scored above nine an over in the final five overs. Perth Scorchers have adopted a similar method. If the Big Bash is a party, Scorchers are the designated drivers. While opponents begin their innings with the self-restraint of overexcited teens, Scorchers begin theirs with a steely determination to resist the allure of excess. 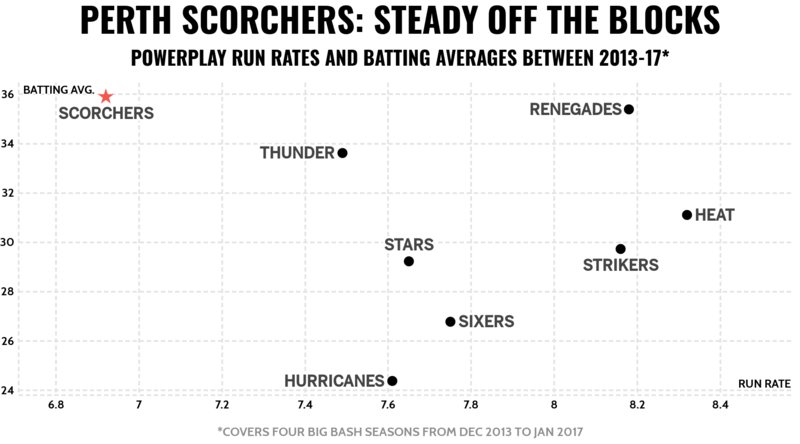 Between 2013 and 2017, the years in which they won three titles in four seasons, Scorchers had the lowest run rate in the Powerplay among the eight Big Bash teams - just 6.46, CricViz found. But their batting average and frequency of wickets lost in the Powerplay was the best of all teams, and they had the second highest run rate in the middle overs, and fourth highest at the death. Scorchers had a distinctive way of constructing a T20 innings: in the four seasons mentioned above, they had the lowest boundary percentage of any Big Bash team, but a batting average of 28.37 - the highest by 10%. Overall, they lose under three wickets in the first ten overs 71% of the time, according to analyst Joe Harris, compared to 56% for the other sides. Michael Klinger is the lone batsman to have represented Perth as well as Gloucestershire. For both teams he has been an opener of extraordinary consistency, and has scored seven T20 centuries. The trade-off with Klinger is that in return for his copious runs, the team gets an opener who begins at a sedate pace. Klinger's strike rate, of 7.13 every six balls, is the lowest of any of the top 30 T20 run scorers between the start of 2017 and November 2018. As well as fitting in with the Gloucestershire budget, his prowess across the three formats, and his character, Klinger was identified as ideal to the club's T20 strategy, explains John Bracewell, who was head coach in 2013, when they signed Klinger. "We had some extremely optimistic young hitters who loved the T20 environment and Maxi [Klinger] able to consistently bat half the overs allowed the rest to target 60 balls per match. This was more about adapting to our strengths and recognising our potential flaws." Gloucestershire had finished bottom of their group in three of five seasons before signing Klinger. In the six seasons after, they made the quarter-finals of the T20 Blast twice, and topped their group once. For a Klinger side, a Powerplay score of around 40 for 1 is typical - a below-average run rate, but with a below-average number of wickets lost too. This method was ideal for Scorchers, whose bowling attack was outstanding. At various times, it included the right-arm pace of Nathan Coulter-Nile and Jhye Richardson; the variations of Andrew Tye and Yasir Arafat; the left-armers Mitchell Johnson, Jason Behrendorff and David Willey; left-arm wristspin from Brad Hogg, and conventional left-arm spin from Ashton Agar - all of whom are internationals. It was prudent to embrace low-risk batting. Top-order players like Klinger, Shaun Marsh, Adam Voges and Ian Bell - one of Scorchers' overseas players in the victorious 2016-17 season - minimised the chances of a batting collapse, setting games up at Scorchers' tempo. 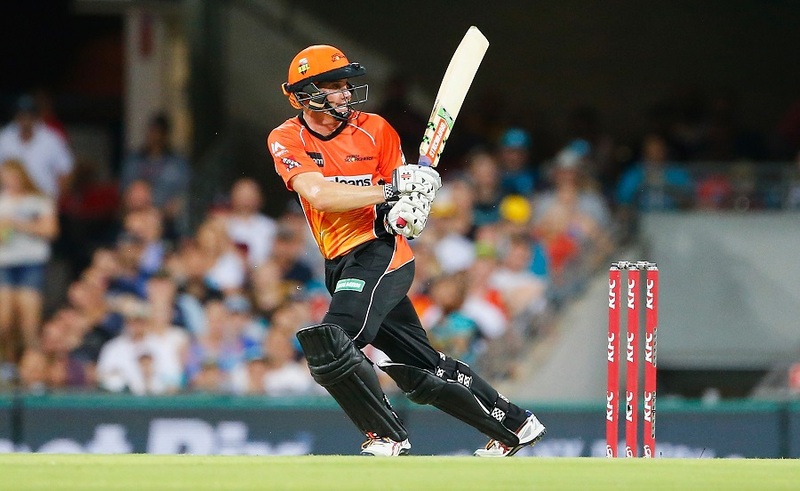 But the higher the scoring conditions are in a game and league, Dan Weston of Sports Analytics Advantage has found, the riskier a batting strategy like Scorchers' is, because there is more left for teams to make up later in their innings. Weston also notes that in Justin Langer's incipient reign as Australia coach, his side has adopted very different tactics at the top of the order to Scorchers' - suggesting that Langer embraced Scorchers' slow approach at the top out of pragmatism rather than out of a belief that this was always the best template to win games. For Scorchers, starting cautiously proved perfect for its time, underpinning one of the most dominant dynasties in domestic T20 history. But as overall T20 scores rise, beginning sombrely is a tactic that threatens to become obsolete. 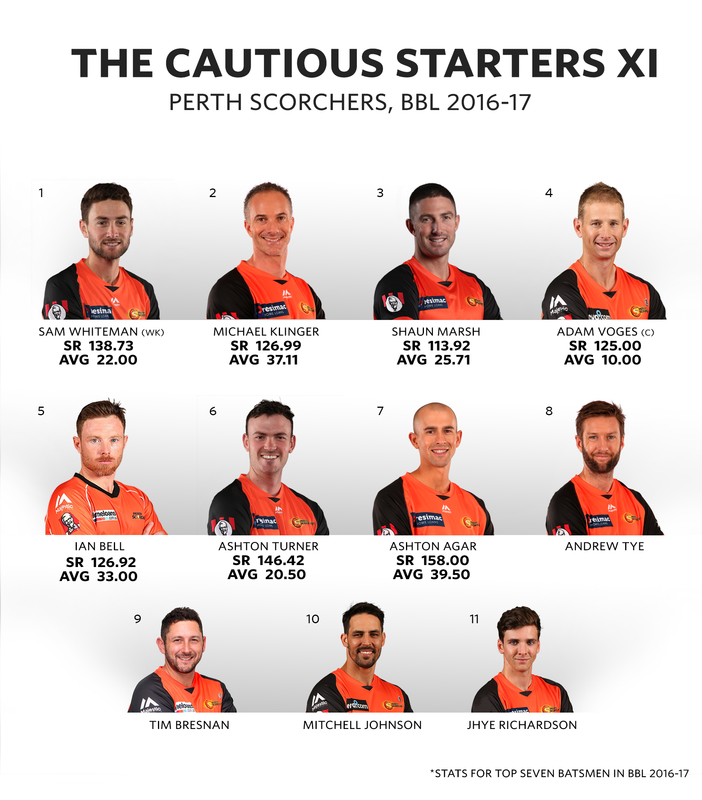 What makes the Perth Scorchers' list remarkable?